This is a highly schematic map of the trackage on Canal Street and in the Canal Street area late in the horsecar era, about 1890. Data are from pictures in this article and from Hennick & Charlton. Only streets of interest are shown. The map is not drawn to any scale. The green circle at the corner of Canal and St. Charles Streets represents the Henry Clay statue. The smaller green circle at Canal and Camp Streets represents the Canal Fountain. The other smaller circles in various colors, connected to the tracks, represent turntables. The details of the West End steam line's Canal Street terminus are unclear. The line was started in 1876, and its terminus was supposed to be at Canal and Carondelet. But court records show that objections were raised to steam operation between Basin and Carondelet Streets, and injunctions prevented steam operation in that section between at least 1880 and 1883. Operation over that section may have been by animal power, or something other than steam; or the line may have simply terminated at Basin Street. It seems likely that the locomotives could operate in both directions. There must have been track switches allowing the locomotives to drop their trains, then run around them, back up to the coaches, and recouple for the return trip. Whether these switches were near Basin Street or Carondelet, and whether they were moved in response to the court cases, is unknown. The available pictures do not settle the issue. An 1883 insurance map shows a center track between Baronne/Dauphine and Carondelet/Bourbon, apparently for West End trains. 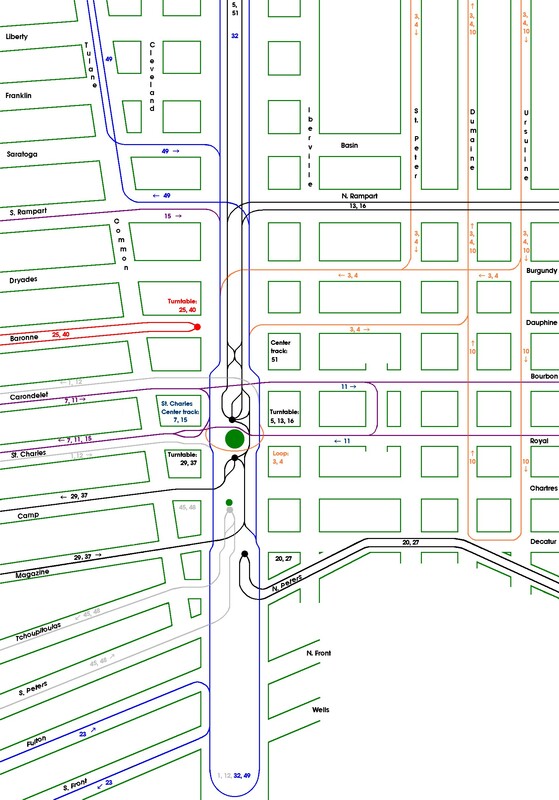 The arrangement of switches and crossovers shown at Canal and Carondelet is based primarily on that map and on Picture 30. The details of the tracks between Camp/Chartres and Magazine/Decatur are also unclear. The arrangement shown is based on Pictures 46 and 65. Click here for a list of route names and numbers.